Now that I've covered the Washington Monument, the architecture of the buildings in the vicinity, and the Mount Vernon Place United Methodist Church it's finally time to move on to the park squares that surround the monument in the shape of a Greek cross. I thought perhaps an aerial view might give you a better understanding of what I'm talking about but not having had access to an aerial balloon which would have been the best method to get a good picture, I used one from Google Maps. This picture was taken from the direction of downtown Baltimore and the Inner Harbor heading north; the Mount Vernon UMC, which sits on the northeast corner, can be easily spotted and serves as a good indicator of direction. Truth be told, were I a smarter woman, I would have looked at this aerial map before I went to Baltimore but live and learn I guess! 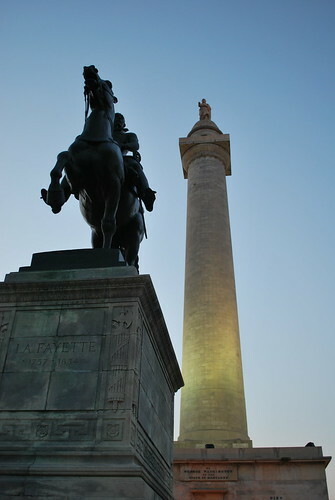 Anyhow all lamenting aside, as previously noted, Colonel John Eager Howard died in 1827, two years before the completion of the Washington Monument which stands on land he gave to the City of Baltimore. 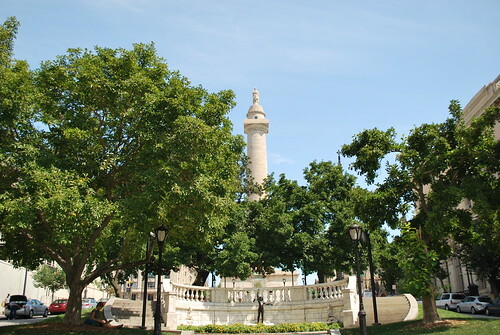 Following the death of the former Governor of Maryland, his heirs laid out the four park squares surrounding the Monument in the form of a Greek Cross. 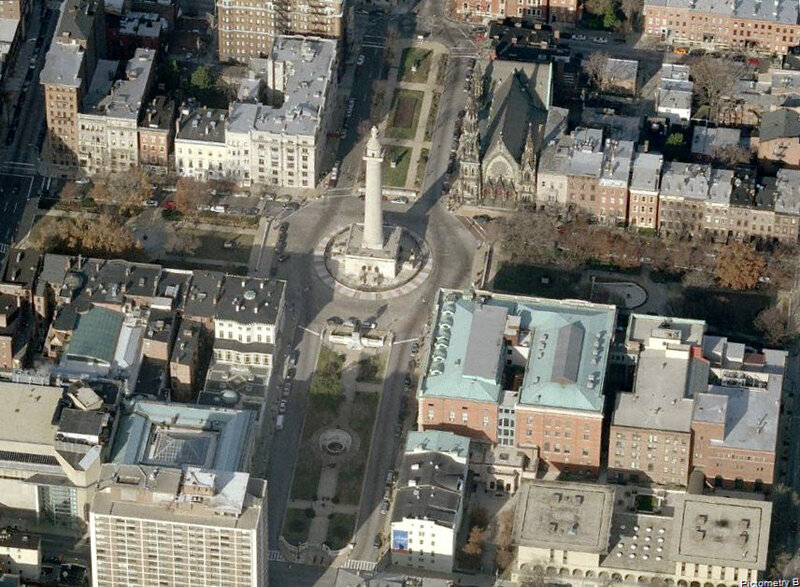 The squares running north and south from the Monument are named Washington Place and those laid out to the east and west are named Mount Vernon Place. If you ever decide to go to Baltimore and check out the area yourself, type either of those streets into your GPS unit and you'll have no problems getting there. As mentioned in previous posts, in the 1840s the City of Baltimore really began to boom and the town started to grow out towards the Monument which stands on the highest point in the city. Colonel Howard's family sold lots bordering the four parks to some of the city's most prominent families who in turn built some of the most elegant townhouses to be found in Baltimore. As the fashion of the day changed, so did the landscape of the parks. At one time trees were allowed to grow tall but then they were cut down as they marred the view and until the 1890s the grass plots were enclosed within fences. 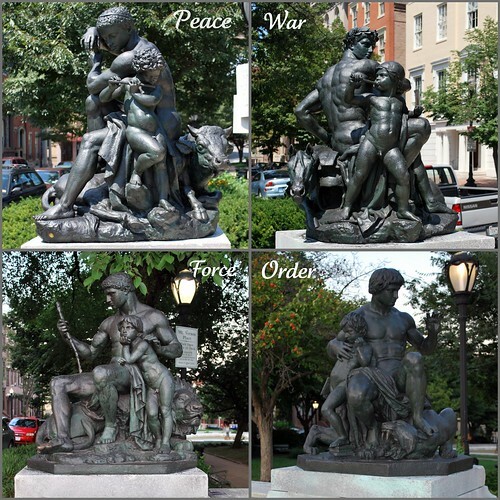 Each separate park at Mount Vernon Place holds its own statues and fountains - some are sculptures by famed French goldsmith-turned-sculptor Antoine-Louis Barye (donated to the city by collector William Walters) and others are statues to famed Maryland historical figures like Colonel John Eager Howard and Chief Justice Roger B. Taney who was the first-ever Catholic to be appointed to the United States Supreme Court. Unfortunately, what Chief Justice Taney is best known for is delivering the majority opinion in the Dred Scott case. Not a great legacy to be sure! 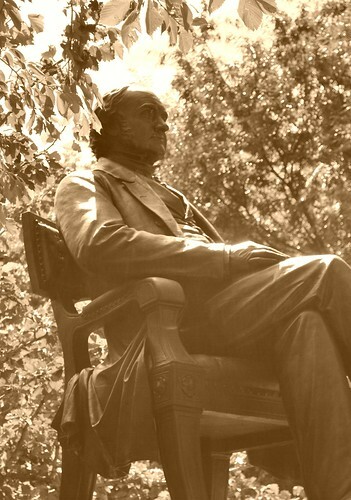 In addition to those statues, a likeness of George Peabody reposes comfortably in the park in his chair across from The Peabody Institute. A couple of the fountains weren't in operation and I even missed an entire statue dedicated to Severn Teackle Wallis, a prominent Baltimore attorney and political reformer of the late 19th century whose statue stands in East Mount Vernon Place. I guess this is why I will never get a job as a travel writer - I miss things! 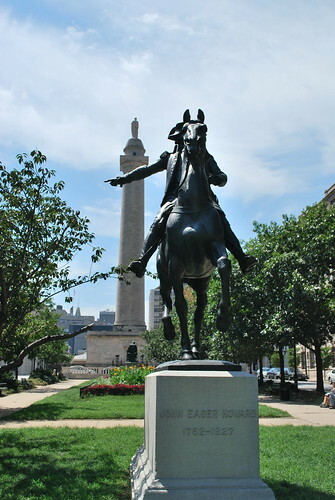 The last major piece of sculpture that was added to the parks stands at the northern end of South Washington Place and is the equestrian statue of Lafayette which was dedicated on September 26,1924 to the memory of the fallen American and French comrades of World War I. Marie-Joseph Paul Yves Roch Gilbert du Motier, Marquis de La Fayette was a general in the American Revolutionary War and a leader of the Garde Nationale during the French Revolution. 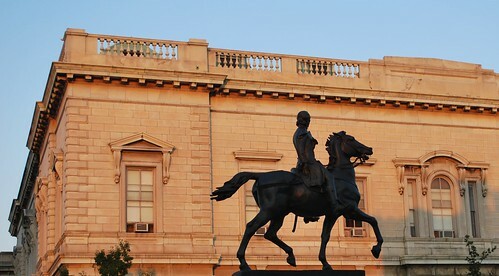 On the anniversary of Lafayette's birthday, the 16-foot tall bronze monument sculpted by Andrew O'Connor Jr, an American-Irish sculptor born in Worcester, Massachusetts, was dedicated atop a 20-foot tall Cockeysville marble base. Oh - and just in case you're curious - Cockeysville marble is a building stone quarried in Baltimore County, Maryland which is a metamorphic rock of Precambrian age, about 600 million years old. Originally a limestone, it was transformed by heat and pressure into marble. As per my want, I took an awful lot of pictures (i.e. way too many!) of the area both while I was there around noon and again later in the evening when I walked back over from my hotel to catch a bus. As such, I've put them together into a slideshow to share with you. Some of the pictures have captions that seem to get in the way and the picture quality isn't all that great so if you'd like to get a better look, feel free to click on over to my Mount Vernon Place set over on Flickr. I apologize for the redundancy but sometimes I just find it way too hard to pick only one picture to share! Loved all the Baltimore pics! Been a bit busy to comment on all, but I was here, I saw, I enjoyed! Hope you have a beautiful day. I have seen these monuments so many times and was always to busy to learn about them. great history lessons and baltimore has come so far from its low in the early 70s. i am so happy about this! You really captured the historical importance of the city. Beautiful photographs. Tons of history in that fair city...and totally beautiful sights. Love seeing it all! Keep'em comin'. I learn so much coming here. Another fine history lesson. Much I didn't know. Thank you. Photography Rule #1: You can NOT take too many photos. Photography Rule #2: See Rule #1. A travel journalist would never try to cover an assignment in one or two days. I lived in the Boston area for 20 years and have hardly seen anything! Great photos and history, and looking forward to more! PS. Sat the 28th is still the best day for me and you'll be a mere 30 minutes away when you bring Amanda to college. Maybe we can meet up then? What's your schedule on that day? I have the high school mini-reunion thingy from 4-6ish, but other than that I'm free. you have developed the most wonderful talent at capturing light!! Why didn't I know how beautiful Baltimore really is? I never heard anything positive about it I guess. Wonderful, interesting photos. I learned some history here, Duchess. Re: Dianne's comment. I got the Emery Cat thing for Linus and he likes it! It has helped with his nails.